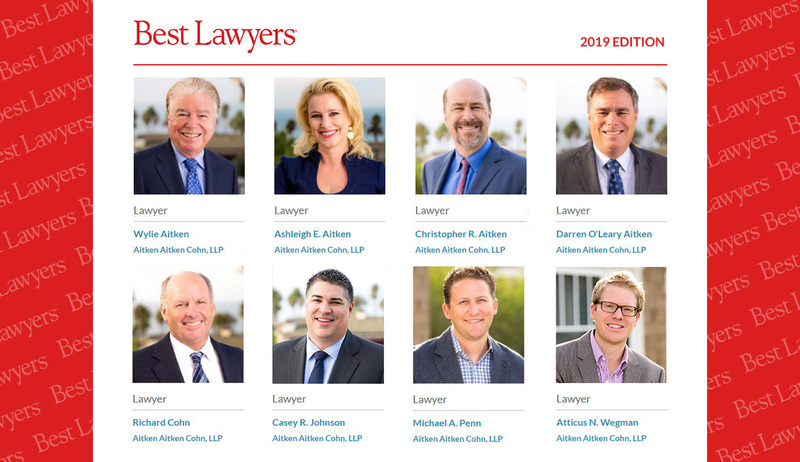 All Qualified Aitken Aitken Cohn Attorneys Named to the 2019 Best Lawyers® in America List! Aitken Aitken Cohn is pleased to announce that all qualified lawyers, eight in total, have been included in the 2019 Edition of The Best Lawyers in America! This is the 31st consecutive year that founding partner Wylie Aitken has received the Best Lawyer distinction; the 6th consecutive year for partners Darren Aitken, Chris Aitken, and Richard Cohn; the 3rd consecutive year for Ashleigh Aitken, Michael Penn, and Casey Johnson; and the debut year for associate Atticus Wegman (now having been in practice for 8 years)! AAC is tied #1 for the greatest number of lawyers listed in Personal Injury in the entire Orange County metro. AAC ranked #2 for the greatest number of lawyers listed in Product Liability in the entire Orange County metro. AAC is #1 in Santa Ana for the number of lawyers listed in Plaintiffs’ Product Liability Litigation. Best Lawyers® is one of the oldest and most respected peer-review publications in the legal profession, widely regarded by both clients and legal professionals as a significant honor. With all our firm’s qualified attorneys making the prestigious list in 2019, Aitken Aitken Cohn is honored to be held in such high regard by our clients and colleagues.